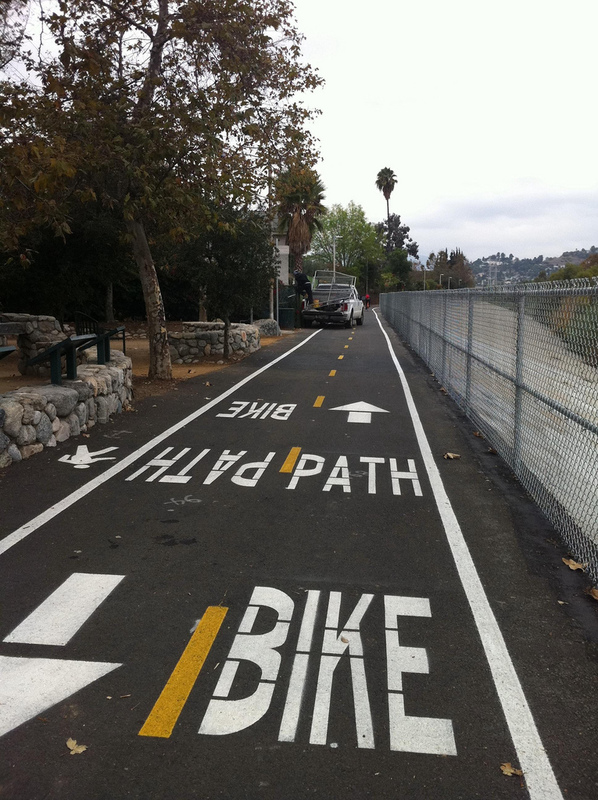 The newly paved and striped bike and people path on the Los Angeles River in Elysian Valley. 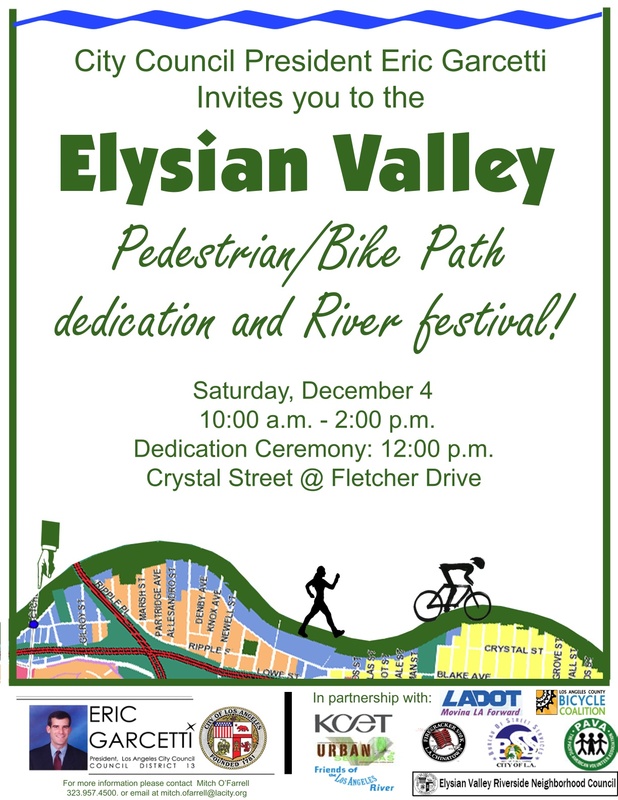 Saturday, December 4th at 12:00 pm, Los Angeles City Councilmember, Eric Garcetti will officially dedicate the just completed Elysian Valley Pedestrian and Bike Path on the Los Angeles River. The project was first approved in 1999, but became bogged down in a what seemed like an endless struggle with easements, property rights, contractors, funding, legal concerns, environmental concerns, jurisdictions, and general bureaucratic laziness. But thanks to constant prodding from activists, and determined leadership, the new bike path is here at last. 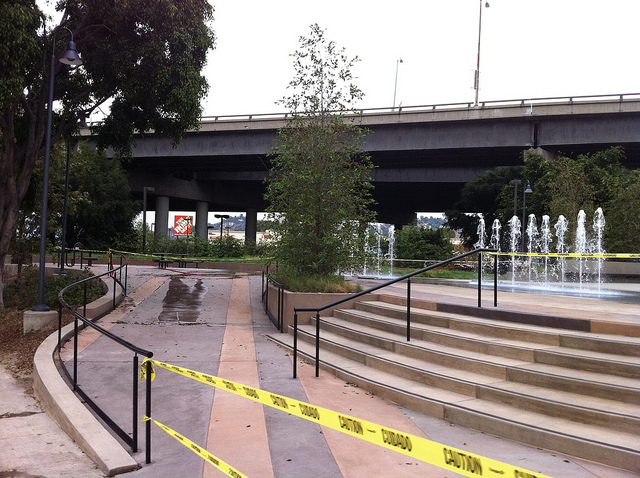 For more on the history of this section of the L.A. River Bike Path, check out L.A. Creek Freak. For some photos of the path back in February, see my flickr set. 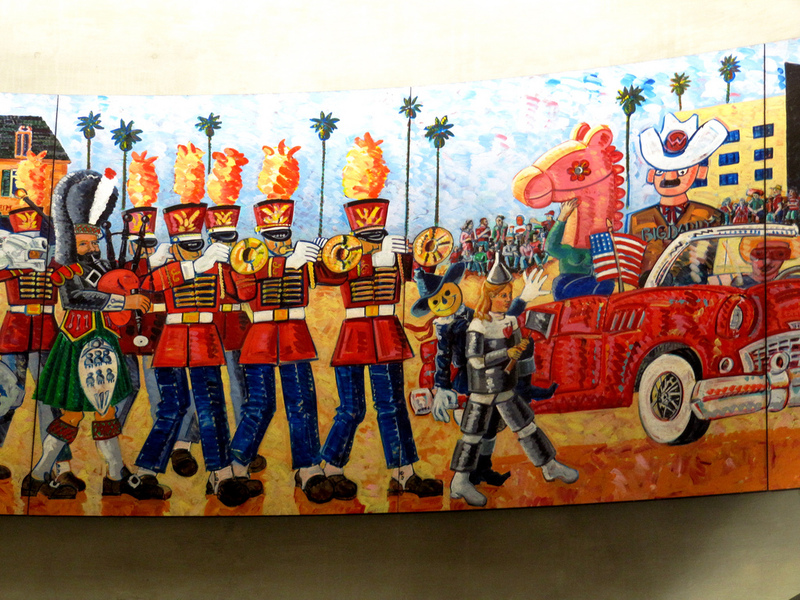 Frank Romero’s “Festival of Masks” (1996). As an added bonus this weekend, the bike path-adjacent, Romero Studio will be open for its 29th Annual Christmas Sale. This will be the public’s last chance to visit the Romero’s Frogtown Studio. With sadness and envy we say goodbye to the Romeros who have lived and worked at their Frogtown studio for the past 30 years. Frank and Sharon Romero are selling their building to spend more time in the Rhone River valley of France where they practice their latest love, plein air painting. The studio is open on Saturday, December 4 & 11, from 7-midnight; and Sunday, December 5 & 12, from noon-6p, and is located on the corner of Blake Avenue and Eads Street in Frogtown, AKA Elysian Valley. Confluence Park at Figueroa Street and San Fernando Road in Cypress Park. As an added added bonus, stop by and see Mountains Recreation and Conservation Authority’s newest pocket park titled, Confluence Park, located where a million pigeons once lived at the corner of Figueroa and San Fernando near the end of the bike path. Again, with all things L.A. River, check out L.A. Creek Freak for more on this development. 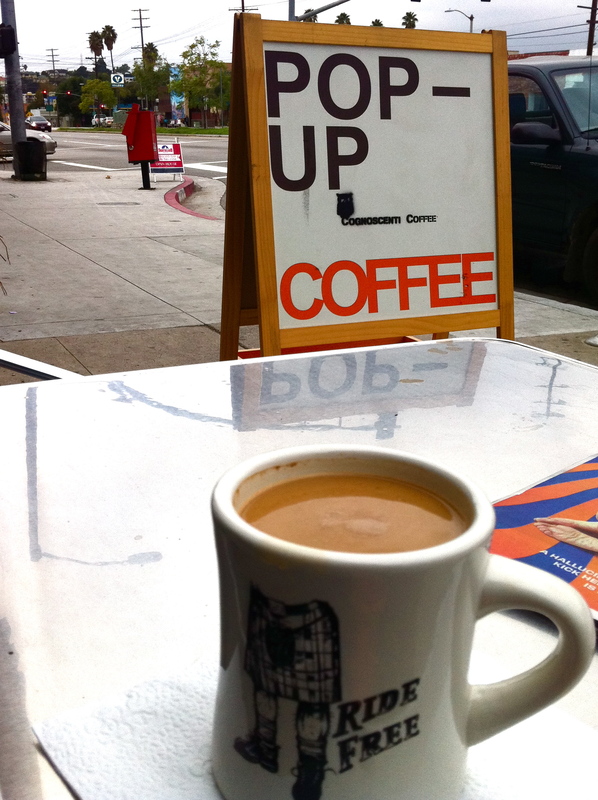 Riding Free with Four Barrel Coffee from San Francisco. As an added added added bonus, former Eagle Rock pop-up coffee shop, Cognoscenti has now popped-up inside newly opened, Proof Bakery at 3156 Glendale Blvd. in Atwater Village. The shop is just a few blocks from the L.A. River Path, and serves the best coffee and pastries in Northeast Los Angeles. –Which should be delightful on a cloudy December Saturday with a 30% chance of rain. Whoops! Forgot to mention, KCET will be down by the river in the pocket park at Crystal & Fletcher near the bike path gate from 10am to 2pm on Saturday collecting people’s LA River Stories!